Just Marvy! : We already know what happened. So uhm. 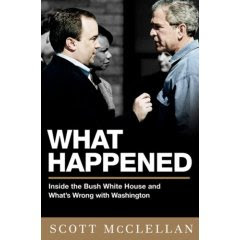 It appears that former white house press secretary, Scott McClellan has a leaked tell-all memoir that’s officially out next Tuesday. The book, “What Happened: Inside the Bush White House and Washington’s Culture of Deception”, apparently exposes the truth behind certain hot button issues such as the Iraq war, Valerie Plame, Hurricane Katrina, Karl Rove, Bush’s machinations, cover-ups by the white house press corps, etc. etc. While any insider information exposing the manipulations and underhandedness of the current administration is often desperately welcomed, McClellan’s truths, however, are five-years too late. So late, that everything in there will likely elicit “duh” reactions from the readers: The Iraqi war was all propaganda- duh; Condoleeza Rice was a puppet and was too deferential- duh; the press corps gave the president an easy pass on Iraq- duh... about as relevant as the "breaking" announcement that Ashlee Simpson is pregnant (no!!). McClellan, we needed your honesty a long time ago. When it, well, mattered. It all began when my mother, headed into her thirties and still childless, sought a deal with the devil. “the future child's soul”, the devil said, “For the first 100 years of his life. He shall apprentice under me, I will make none greater, and he shall destroy great nations…"
Seriously- who wouldn’t stand in line for that?